Earlier this week, I went to my local convenience store with my cousin to buy a coffee. 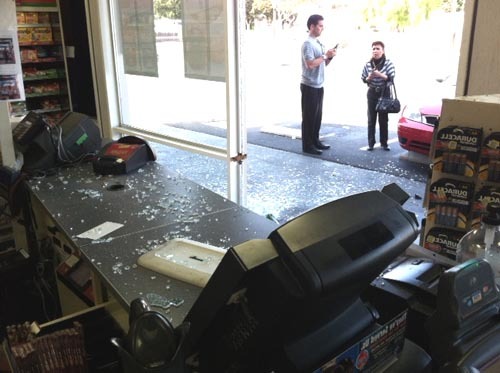 While standing at the register a car crashed through the window. It was a terrifying experience. Only moments before that happened I was going to walk through the area where the car smashed through the glass. However, my attention had been diverted and I chose to walk the long way around the counter to look at a product my cousin wanted to show me. Fortunately, I was not struck by the vehicle, but was hit by flying glass and debris. While waiting for the police and fire department to arrive, I was speaking with the staff and owner of the store. What I found shocking was that the owner told me "this has happened before." Over the last several days, his comment has stuck with me. If he was able to reasonably foresee that this could happen, why hasn't he installed vertical barriers? 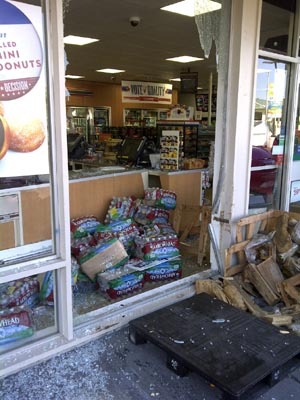 While we were lucky to walk out of the store and return home to our families, this could have been a tragic event. The more I think about what happened—and believe me it has popped into my head quite a few times this past week—the more outraged I am that there were not vertical barriers installed or some type of pedestrian protection barrier on the property. I am sure many people have seen the videos of cars crashing into stores. Usually, they show these on "Caught on Camera," but I don't think anyone can truly appreciate how quickly the things happen. There was no warning, it happened so fast. I keep playing the event back in my mind and I cannot believe how quickly it all happened. It was a miracle I walked out of that store. Many thanks to Ricardo for contacting StorefrontCrashes.com and writing about his experience.